Scrap Dat is Less Than 3 Weeks Away! In less than 3 weeks we will be scrapbooking at Scrap Dat. In less than 3 weeks we will be having so much fun, learning, gathering, working, eating, laughing and having a great time. We hope you have been collecting your projects and are starting to pack up. That always seems to be the hardest part for us. In order to be guaranteed a t-shirt from Scrap Dat, you must register by April 16, 2014. After that date, if you register, we can not guarantee that you will get a t-shirt. We may have some extras but the sizes will probably be L or XL. We want to let you know that we have some great vendors at Scrap Dat – Gigi’s Scrapbookin’, Kit-a-licious, and Laurie Varner with Close to My Heart. Check the website soon for workshops available with these vendors. Hope you come hungry to the crop. We have breakfast, lunch, dinner and snacks available through local restaurants that will be serving at the crop – Coffee Rani, Camellia Cafe, The Scotts’ Coffee & Tapas and BOPS. You might want some pampering at the crop from handling paper or hunching over your layouts. On Friday and Saturday A’jour Academy of Beauty will be available for manicures and American Medical and Chiropractic will be giving 10 minute chair massages for free. If you have not registered, or know of someone who wants to go to Scrap Dat, there still is time. Go to the Registration page on our website, scroll to the bottom of the page, select the crop you want, and then proceed to checkout. If you want to be sure you get a t-shirt, you must register by April 16 (the day after that other big due date). Shoppers must register to get a shopping pass. http://scrapdatproductions.com/wordpress/wp-content/uploads/2014/01/logo-in-parenthetical-frame-with-mixed-font-and-scissors-300x300.jpg 0 0 Scrap Dat http://scrapdatproductions.com/wordpress/wp-content/uploads/2014/01/logo-in-parenthetical-frame-with-mixed-font-and-scissors-300x300.jpg Scrap Dat2014-04-14 09:24:022014-04-14 09:24:02Scrap Dat is Less Than 3 Weeks Away! If you can’t make the full 3 day weekend, you can now sign up for 2 days or single days to crop until you can’t crop no more! Go to our Registration page and scroll down to Register online. We are accepting online registration until 4/30/14 midnight. You can register at the door but we can not guarantee there will be space available. For those of you who prefer to fill out a piece of paper and send it in your with a check or money order, well, we have a Scrap Dat Registration form all set for you. 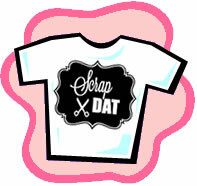 You can also shop at Scrap Dat. You must register to shop. There are options to shop Thursday, Friday and Saturday. Please know that you can also eat and attend workshops and make ‘n takes but you will not be able to crop. If you do, you will have to pay for that day – $80. Also t-shirts are for registered croppers but you can buy a t-shirt at the crop. Register soon so we have a close to final count for t-shirts and tables and chairs. After that, start getting ready to go to Scrap Dat!!! – You need to register if you have not already! – Planning and packing must begin. – Photos need to be printed. – How about first lost tooth, first steps, first date? We will send out more reminders as we get closer. While you all are doing the above and more, we will be finalizing things on our end, working on the seating chart, creating the t-shirt, planning the menus with the food vendors, and so much more. Check the website for registration dates for 2 day crop and single day crop registration as well as shopping passes. Gotta run. Have a lot of things to do now that we mention all of this!